When you walk into the Cheshire Public Library you enter the main floor lobby. 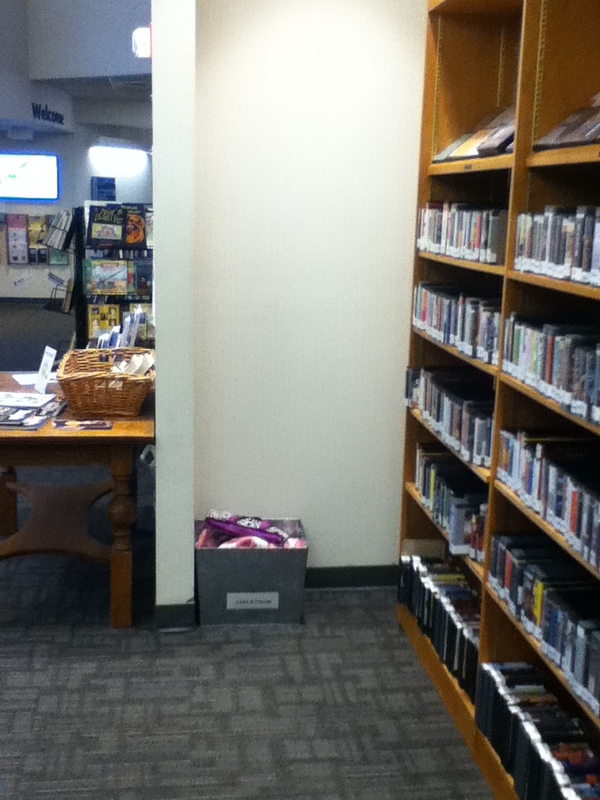 This large area is home to CD’s, DVD’s, Audiobooks, adult fiction, and new books. There are also a variety of displays, the public catalogs, the circulation desk, and the Friends book sale and donation area. Most regular visitors to the library are aware of their favorite areas, and browse those areas comfortably. However, like in the children’s room there are some hidden treasures that often get over looked and deserve some attention. I have always been a big fan of science fiction and fantasy, and love helping people discover new authors and series to explore. Unfortunately, most people miss our Science Fiction shelving area entirely. 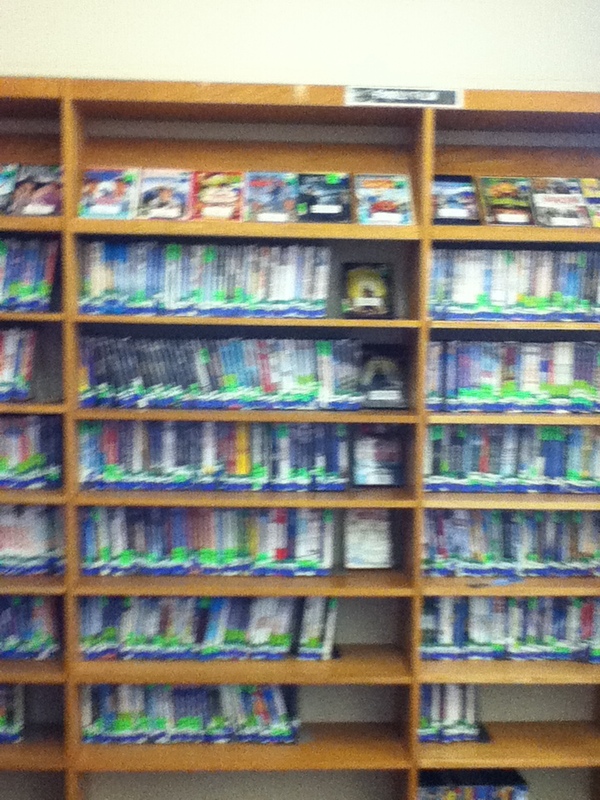 As with our mystery books, they are shelved separately from the rest of the fiction. You can see which area any adult (or children’s) book is shelved in by reading the call number. Adult fiction call numbers will all start with where they are shelved; Fiction, Mystery, or Science Fiction. The mysteries are easy to find, since they are shelved right after the regular fiction. However, the Science Fiction materials are shelved on the wall near the fiction between the audiobooks and classic movies. Graphic novels are not just for children and teens. Take for example the popularity of The Walking Dead. 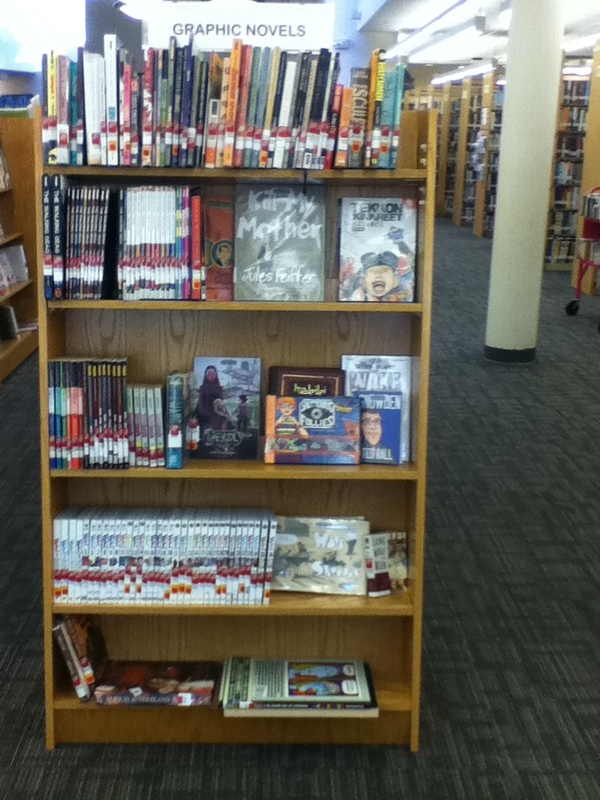 Our selection of graphic novels in the lobby is not huge, but it is high quality and well worth taking a look at. Since it is a fairly small collection it might be easy to over look, but it is not hard to find or to browse if you are interested. The collection is housed on the endcap of the New Biography and Nonfiction shelf, facing the windows and DVD’s. If you like what you see, but are looking for even more graphic novels, do not be afraid to explore the large selection in the Teen’s Room! 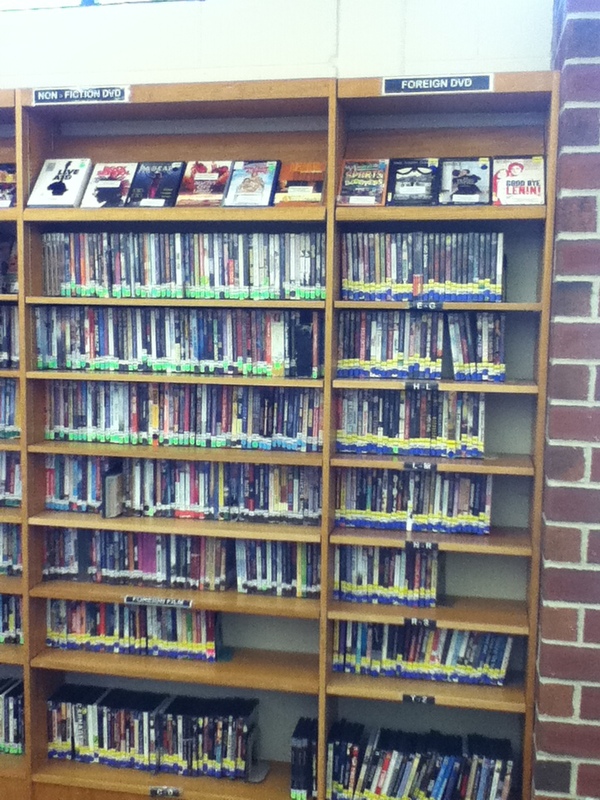 Most regular visitors know where to find the DVD’s they enjoy most, and where our Quick Flick, New, regular, and Blu-Ray movies are each shelved. 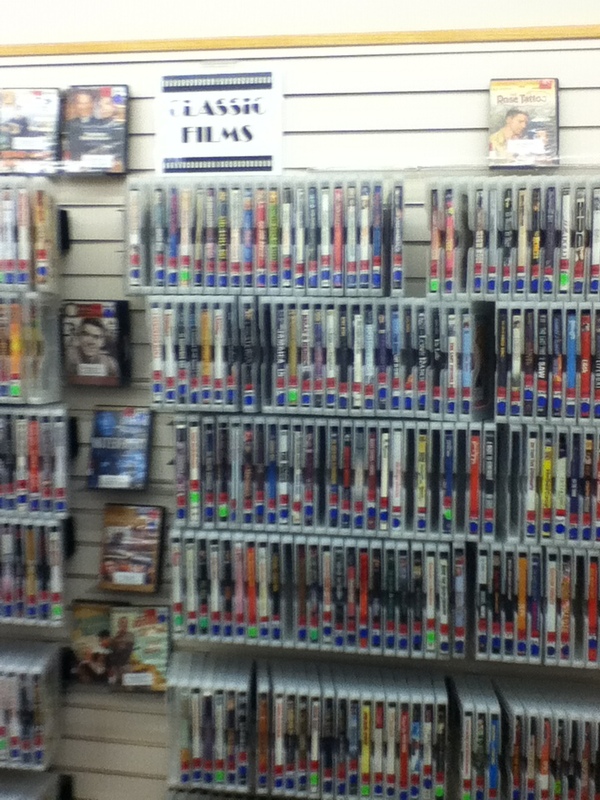 However, there are a few groups of films that are shelved separately. We have labeled these disks and changed their call numbers to match these special areas, but infrequent movie borrowers might not know about these little nooks and crannies. 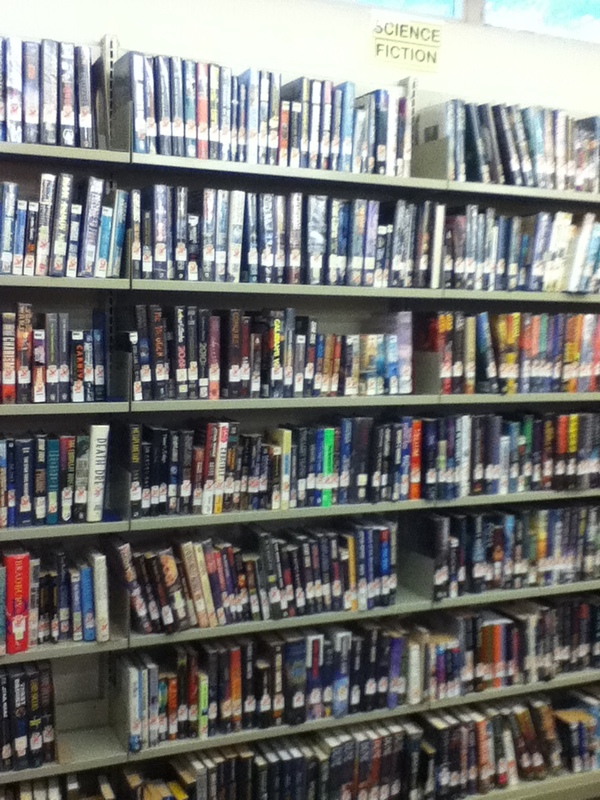 Classic movies are labeled with a red Classics label and are shelved on a slat-wall display on the wall by the fiction books. 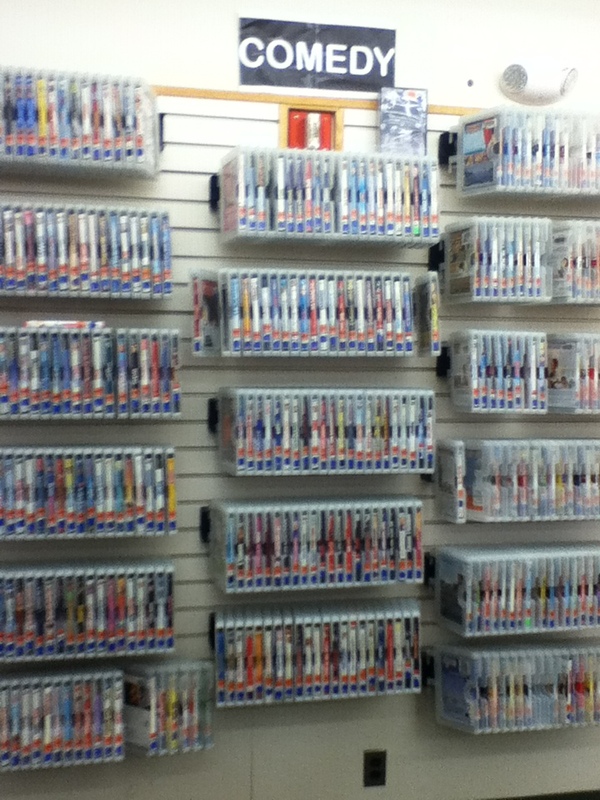 Comedy movies have an orange Comedy label and shelved in the next slat- wall display. On the same wall, in the build in bookcase between those two slat-wall displays, you can find the television show box sets which have a bright pink TV label on them. If you keep following that wall to the corner you will find the Family Films (with a green label), and in the next bookcase after a window you can find the non-fiction films (classed by number) and the Foreign Films which have a yellow Foreign sticker on them. While not a part of our library collection, it is an often asked for and searched for item. Small or valuable items (wallets, phones, jewelry, etc) that have been turned into library staff stay at that service desk for a time and then are tucked away in a safe until claimed. However, items like coats, mittens, notebooks, umbrellas, and so on are kept at the service desk of the area they were found in for a few hours and are then placed in our Lost and Found bin. This is located between the Friend’s donation area and the Audiobook collection. Do not forget about the variety of ever changing displays. Any of our items that are on these displays can be checked out. If you are still unsure where to find what you are looking for swing by the Circulation desk and we would be glad to help you! I recently discovered the BBC America series Orphan Black, somewhat by accident. In my job as Social Media Coordinator at Cheshire Library, I spend a lot of time on various social media networks, where I’d see Orphan Black referenced regularly. The show has a very vocal online fandom, particularly on Twitter and Tumblr, and I guess this is a good example of social media effectively surpassing traditional advertising in getting the word out about something. After the fandom’s outpouring of joy when the show’s lead, Tatiana Maslany, was nominated (finally! they exclaimed) for an Emmy, I decided to see what all the fuss was about. Luckily we own Seasons One, Two, and Three here at CPL, which allowed me to binge-watch my heart out, and guess what? They got me! It’s a really riveting show that, not being a huge sci-fi fan, I normally wouldn’t have thought to watch. I have joined the masses in my awe of Tatiana Maslany’s “heavy lifting” as an actress, playing multiple clones in each episode and making them all identifiable and unique. False Sight by Dan Krokos. Resolving to move past the disturbing truths of her clone origins to enjoy time with Peter and her other friends, Miranda is compelled to follow her genetically programmed instincts when a member of her team turns rogue and triggers a humanity-threatening war. Project Cain by Geoffrey Girard. Jeff Jacobson learns that not only was he cloned from infamous serial killer Jeffrey Dahmer’s blood as part of a top-secret government experiment, but there are other clones like him and he is the only one who can track them down before it is too late. Falls the Shadow by Stefanie Gaither. When her sister Violet dies, Cate’s wealthy family brings home Violet’s clone who fits in perfectly until Cate uncovers something sinister about the cloning movement. Murder, morality, and a slow-burning romance fill the pages of this futuristic thriller. The House of the Scorpion by Nancy Farmer. This modern classic takes on an iron-fisted drug lord, clones bred for their organs, and what it means to be human. Winner of the National Book Award as well as Newbery and Printz Honors. Never Let Me Go by Kazuo Ishiguro. Kathy grows up at a peculiar English boarding school called Hailsham, knowing that she and her classmates are “donors,” clones raised for organ harvesting. Kathy has deferred her fate by becoming a caregiver for dying clones, including her close childhood friends Ruth and Tommy. This award-winning novel straddles the YA and Adult Fiction genres, and takes the reader on a real emotional journey. I have not read a book this gripping in ages. Oh, sure, I adore the Retribution Falls series by Chris Wooding, they are delightful and make my heart sing, but in The Martian, Andy Weir has managed to catch me in my weakest spot, a tale that feeds both my need for a good imagine-if story and lovingly nerdy details that set my non-fiction scientific brain on fire. I got to the end, and I wanted to read it all over again. Very rarely do I seek a book out. They just happen to come to me in weird ways and tickle my interest enough that I open the cover (and covers are so VERY important. If it wasn’t for the fantastic artwork on the original Dragonlance books, I never would have entered a world that kept me trapped for more than ten years and ultimately sent to me to Lord of the Rings, which, really, is the Great-Granddaddy of the genre anyway). This time, I saw the trailer for the upcoming movie version of The Martian (release date: October 2, 2015), and was intrigued enough that when the book passed through my hands, I grabbed it. 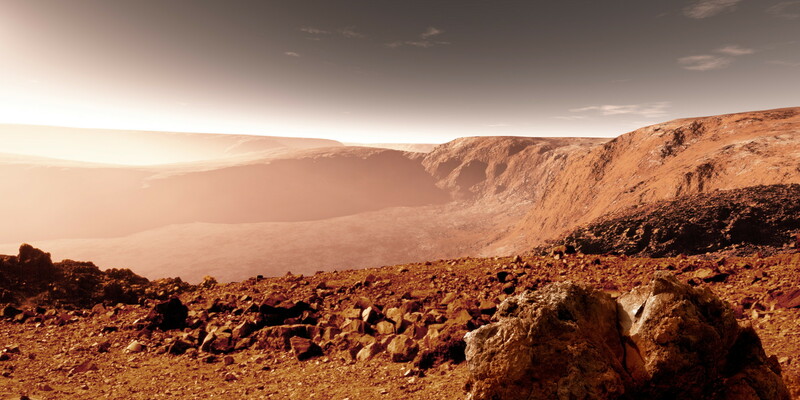 Mark Watney is a crewman on the third manned mission to Mars. When a dust storm hits the crew on their way back to the lander, a piece of equipment snaps off and skewers his spacesuit, sending him reeling down a dune. His crew searches, but can’t locate him in the storm. His vital signs aren’t registering, and they all saw him toothpicked by that antenna. At the last possible second, they admit to themselves he’s dead and blast off to the mother ship while they can. The story revolves around Watney’s ability to survive the impossible, figuring things out as he goes, making everything out of the most basic substances, James T. Kirk channeling MacGyver. Because the supplies left behind were meant for six and he’s only one, he’s able to piece things along using his own ingenuity until NASA realizes he’s still alive. They try and mount a rescue mission, but NASA being NASA and twisted up in bureaucracy and safety margins, not everything is going to go by plan. The chances of Watney making it or not remain 50-50 right up until the final pages. This is a book that will make you sneak off every possible second to read just one more paragraph. From the first page, it will grab you and never let you go. By the end, you’re going to be looking around your house to see if you, too, have anything that can free oxygen or create water, and you will never look at potatoes the same way. Knowing that in the film Matt Damon has the lead role of Watney makes you read the story in his voice. He is a brilliant piece of casting; the book seems written for him and he will be utterly convincing in the role. Check out the trailer here: https://www.youtube.com/watch?v=Ue4PCI0NamI . Ridley Scott (Alien, Blade Runner, Thelma and Louise) is directing, and he is certainly adept at handling suspense. I’m waiting to see what they do with the soundtrack, since it’s a running joke through the book that the only music that was left behind is disco (can you imagine being stuck somewhere for months or years with nothing but a few tracks of disco to listen to? I love the Saturday Night Fever album, and I do love ABBA, but not for weeks on end!). You don’t have to know science to enjoy the book. You don’t even have to know your Phobos from your Deimos. You just have to love a good pressure-cooker story. Don’t let this one skip your orbit. Andy Weir, I love you.